Here’s a super easy one for you. Today’s lovely ribbon or border-type tangle Hua comes from Taiwan CZT Mei Hua Teng (Damy). Damy writes that she loves tangles based on the spiral line because there are just so many possible variations. In the case of Hua, some simple curly number 6 strokes create a very pretty pattern. For my first example, I used one of the variations Damy shows in her Zentangle below. Most of these ribbon-style tangles can be used as a fill for a section of your Zentangle® when you place them back to back in stripes, with or without a small space or lines between them. You can also have fun with them in undulating wavy ribbons, either a single row like this example on the right or in back-to-back multiples. 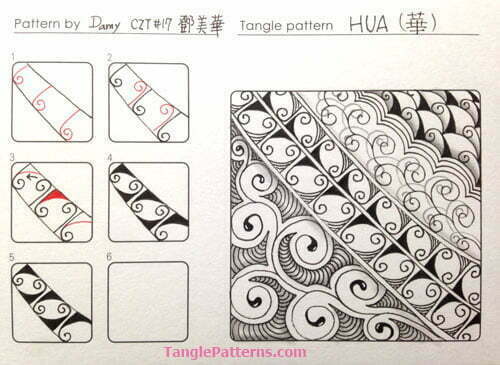 Damy illustrates the steps for drawing Hua below and she features it with variations in a Zentangle along with her C-Six tangle and the Zentangle-original Opus. Remember to turn your tile for Step 2! The second location is in the left sidebar, either in the TANGLES BY ARTIST section or in the TANGLES BY TYPE section (only available in the Desktop version of the site). The tags are all live links, so click on them and see what you get! Can barely wait for the 2016 Tangle Patterns Book! I cherish each and every one! xoxox Happy new year Linda! Thank you for all of your hard work in keeping up! Happy and healthy new year to you! Me too!! Thank you, Damy! I really like this one. It looks like twirled moustache.